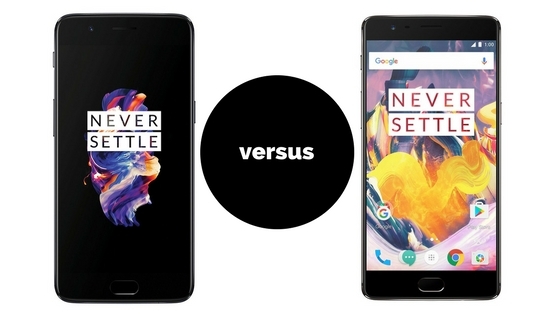 OnePlus 5 vs OnePlus 3T - to upgrade, or not to upgrade? Now that the OnePlus 5 has been launched let us have a look at how it stands out compared to its predecessor, the OnePlus 3T. To upgrade, or not to upgrade? That is the question we will try to answer. Let us start by talking about the all-new dual lens camera of the OnePlus 5, which is the main feature that OnePlus wants all of us to 'focus' on in the device. The OnePlus 5 features two sensors at the back, namely a 16-megapixel primary lens with a f/1.7 aperture (believed to capture 34% more light than the OnePlus 3T) and a 20-megapixel lens with a f/2.6 aperture which is a telephoto lens used for the higher optical zoom. It also has a dual LED flash whereas the OnePlus 3T comes with only a single LED Flash. In comparison, the OnePlus 3T features a single 16-megapixel camera lens at the rear. The front camera is a 16-megapixel lens with f/2.0 aperture in both the smartphones. The new OnePlus 5 has a 3,300 mAh battery while its forerunner has a 3,400 mAh battery. Although the OnePlus 5 seems to have a smaller battery capacity than the OnePlus 3T on paper, the company claims it to have a longer battery life thanks to various on-board hardware and software optimizations. While there are many changes concerning design in the OnePlus 5, it can be said that the rear design was inspired by the Apple iPhone 7 and looks very similar to the Oppo R11, which was announced earlier this month. It is worth mentioning here that Oppo is a sister-concern of OnePlus and Vivo, with the parent company being BBK Electronics. The OnePlus 5 is the slimmest phone made by OnePlus so far at 7.25 mm thickness and weighs 153 grams compared to the OnePlus 3T which is 7.35 mm thick and weighs 158 grams. The OnePlus 5 boasts the all new octa-core Qualcomm Snapdragon 835 chipset with four cores clocked at 2.45 GHz and the remaining four clocked at 1.9 GHz, whereas the OnePlus 3T has a quad-core Qualcomm Snapdragon 821 chipset with two cores clocked at 2.35 GHz while the other two clocked at 1.6 GHz. The OnePlus 5 also comes with the Adreno 540 GPU while its elder sibling comes with the Adreno 530 GPU. The OnePlus 5 comes in two variants, namely a 6 GB RAM-64 GB internal storage (Slate Gray in color) and a 8 GB RAM-128 GB internal memory (Midnight Black in color), whereas the OnePlus 3T comes with 6 GB of RAM and an optional 64 or 128 GB of internal storage. Also, the OnePlus 5 comes with UFS 2.1 storage, which helps in increasing the bandwidth by 50% compared to the OnePlus 3T which has the UFS 2.0 storage. The OnePlus 5 comes with the all-new and improved v5.0 whereas the OnePlus 3T has the v4.2. Read the difference between the two versions here. The OnePlus 5 comes with Android Nougat (7.1.1) while the OnePlus 3T comes with Android Marshmallow (6.0.1) out of the box, but is upgradable to the latest Android 7.1.1. The OnePlus 3T was released in November 2016 priced at $439 for the 64 GB variant and $479 for the 128 GB model. The Indian pricing is ₹29,999 and ₹34,999 respectively. The OnePlus 5 is priced at $479 for the 6 GB RAM-64 GB variant and $539 for the 8 GB RAM-128 GB model. The Indian pricing is ₹32,999 and ₹37,999 respectively. Coming back to the question we were set out to answer, the latest chap from the OnePlus family sure looks stronger than its elder sibling on paper. The dual camera setup is a significant boost for the photography enthusiast in you. The design may not be novel but makes the phone grab some eyeballs for sure. If you are a specifications guy/girl and love clicking other people or objects from your smartphone, upgrading to the OnePlus 5 is the way to go. However, if you are a selfie-enthusiast, there is no point wasting your hard-earned money to upgrade since the secondary camera lens setup is same on both the smartphones.